Bassist Gastón Joya has been an important presence in Cuba's Jazz scene for some years now, frequently performing with members of the López-Nussa family (as these lines are being typed, he is touring internationally as part of Harold López-Nussa's trio), the Afro-Cuban Messengers (Chucho Valdés) as well as several other projects including the occasional performance under his own name with ensembles of different sizes. 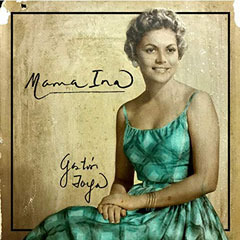 Mama Ina, which is dedicated to his grandmother, is his first commercially-released solo album (a prior album, titled Gastón Joya, has not yet been released). Many of the selections are Gaston's own compositions. The album won the Jazz Soloist category in Cubadisco 2018. Although the name Joya does not translate into the word "joy" in English, that word describes his live performances perfectly - when he is deep into a performance, he almost merges with his instrument without losing his strong connection with the other musicians. This album captures much of that feeling, and the musical emphasis is on the songs rather than pyrotechnics per se. One of Gaston's strengths as a soloist is that he makes the listener take the bass seriously as a melodic as well as a rhythmic instrument. Although he uses both acoustic and electric bass in the album, it is the passages witht the acoustic bass that are the most sublime. The pianist in the trio, Adrián Estévez, is given plenty of room to express himself, and young drummer Marcos Morales, himself a recent JoJazz winner for his own projects, is very effective as an accompanist here. Mama Ina is a very lyrical album (we are, figuratively speaking, at Grandma's house, after all, but what a lively grandma she is! ), and it is an excellent reminder that in the right hands, the bass can be whatever the bassist wants it to be.